For Strobe, LED, Fluorescent, etc. 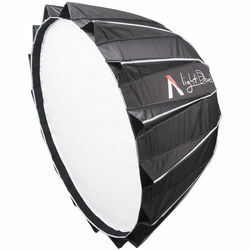 10.8 x 9.25 x 3.48"
A softbox will diffuse harsh lighting and eliminate shadows from your portrait shots. Softboxes are one of the three major soft lighting equipment necessities (the others are scrim and umbrella) used in photography. It diffuses bright light and spreads it evenly over subjects. A softbox can serve as a primary or secondary light source in a scene. It works with daylight, flashguns, and continuous light sources. What Is a Softbox Diffuser? The enclosure surrounds a bright bulb, focuses its light, and then diffuses it as the beam leaves the box. The inner compartment of the device is the baffle. This has reflective sides, usually made of aluminized fabric or lined with aluminum foil. These surfaces prevent light from escaping the enclosure and direct beams toward the diffusing material covering the mouth of the equipment. 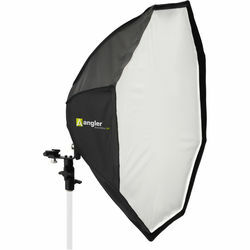 Some flash softboxes have removable front diffusers. With their diffusing covers removed, the photography equipment becomes like floodlighting. What Is the Difference Between a Softbox and an Umbrella? Softboxes and umbrellas do differ. An umbrella is a simple light modifier with an open end. There are two types: reflective and shoot-through. When lighting a scene, the open side of a reflective umbrella faces the subject. For a shoot-through umbrella, the closed side is closer to the subject. In both configurations, diffused light hitting a subject tends to scatter and produces harder shadows as well as lens flare. Softbox lighting kits produce flatter, more even illumination. They may also include softbox barndoors to help control lens flare. Factors to consider when picking a size include degree of light softness, the distance from subject, and whether you want to capture part or all of the subject. Generally, larger light modifiers output softer light than smaller ones. That's because larger front diffusers and internal baffles have bigger volumes and surface areas to spread and soften bright light. Large models also throw light farther than smaller ones. Use small portable softboxes for close-up shots and large freestanding units for full-length portraits. Yes. The most common shapes for this type of light modifier are square, rectangle, and octagon. You can also find this equipment with hexagonal, round, and parabolic enclosures. Each shape modifies illumination from light bulbs differently. For example, square and rectangular models throw light in ways that make it seem to be coming from open windows. to direct soft light. They create better contrast by focusing light on subjects and keeping it from spilling onto backgrounds. Shoot photos like a pro by illuminating your subjects with a softbox. It produces more even-focused soft light than an umbrella. Browse the rich selection of photography equipment at B&H Photo and Video to find different shapes and sizes of this light modifier.